My daughter Lillian is wearing the costume. 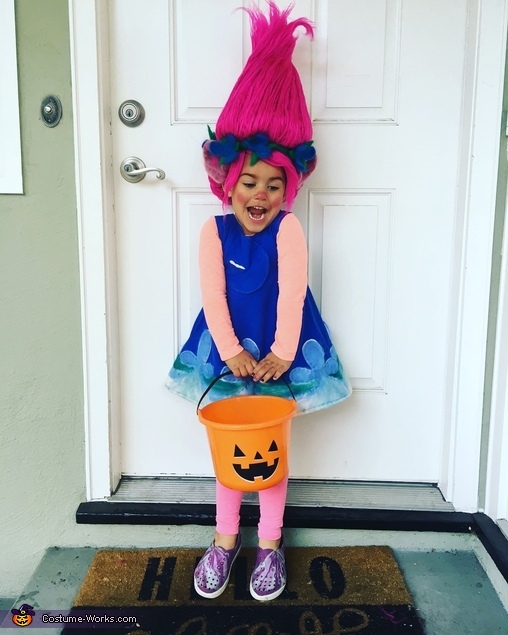 We decided on Princess Poppy from Trolls because my daughter loves her and I love fiber arts. The hair and dress are hand made. The hair is made from hot pink yarn individually cut, unraveled, ironed/pressed, grouped, and stitched onto a wig cap. At the crown of the cap I glued a foam cone and adhered in layered sections the yarn. I used hot glue, spray glue and finished with hairspray. The ears and garland I needle felted and sewed onto the cap. The dress was sewn with royal blue fleece and I attached needle felted appliques for the fluer de lis on the bottom.